For the most part this 9.8-mile route follows the perimeter control dikes in the Pointe Mouillee State Game Area and for some makes too long of a day on foot. The distance is ideal for a mountain bike, however, the reason cycling is by far the most popular way to travel these dikes. The loop begins at the end of Roberts Road near the South Causeway and is covered in a clockwise direction, saving the best for last. Roberts Road is picked up from Dixie Highway 1.5 miles south of the Huron River where it heads due south and in 2 miles ends at a parking area and boat launch. Any outing in the state game area is better enjoyed if you pack along a pair of compact binoculars and if the day is sunny then you will also need sun screen, head protection and drinking water. From the parking area and boat launch head north on Roberts Road for a hundred yards or so to pick up the start of a dike on the east (right) side of the dirt road. It’s begins as a loose gravel dike that heads north but quickly becomes a narrow, grassy two-track. The ride here, if you’re on a mountain bike, requires considerably more effort than anywhere else along this loop. Soon you’re paralleling a channel and will for almost the next two miles. Birdlife, muskrats, frogs and carp can be seen by those who slow down and study their surroundings. At Mile 1.25 the dike swings sharply east and becomes more of a gravel surface for easier traveling. In another 0.3 mile it resumes its northerly direction to reach a pumping station at Mile 2.1. Around the station, used to control the water level in the marches, a handful of dikes head out in different directions. Two of them head due east, paralleling each other with a long narrow pond between them. Head east (right) on either and within a half mile you’ll reach another well-gravel dike. This heads north with Bloody Run Unit to the west and Long Pond Unit to the east. Both units are posted in places and contain marshes infused with bird life. The dike begins as a wide, dry trail but can be wet and muddy at times in the spring. After a spell you have jog west (left) briefly in order to remain on the most distinguishable dike and at Mile 3.7 arrive at a second pumping station located near a junction with another dike. 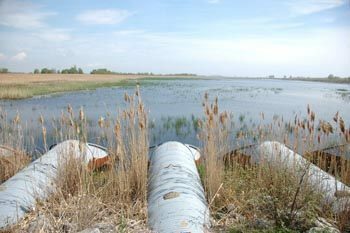 Head southeast (right) on the dike that skirts the open water of lower Huron River. A pull-over – a series of rollers that assists duck hunters with hauling their layout boats over the dikes – within a half mile and at Mile 4.7 is a junction with North Causeway. Head left to follow the causeway past the Vermet Unit, where the large patches of open water usually attract and hold large numbers of birds, particularly swans, herons and egrets. At Mile 5.3 you arrive at junction on the edge of Wildlife Refuge section of the game area. This special area is the man-made barrier island that was the first step in restoring the wetlands. It is closed to hunters in the fall and is often referred to as the “banana” due to its elongated, curved shape. Head left again to hike along the outside of it and skirt Lake Erie. The view changes to a large expanse of a Great Lake to the east as you round the actual Pointe Mouillee while to the west are more cattail marshes humming with winged wildlife. At Mile 6.5 you head east (right) on the dike that heads inland for 0.3 mile before resuming a southerly direction (left) at the next junction. Middle Causeway is reached at Mile 7.5 and is posted with signs for Vermet Unit and Lead Unit. It heads west (see Middle Cause Loop). On this outing you continue south to skirt the inside of the Banana for another 2 miles. To the west (right) is the open water and marshes of the Lead Unit. To the south you’ll see the twin stacks of the Fermi Nuclear Plant in Monroe. Wild birds to the right, nuclear power straight ahead; this is indeed an unusual sanctuary. Soon you’ll also spot the large outlet tubes at South Causeway a mile or more before you reach them. The causeway is reached at Mile 9.5 and crosses a series of tubes. On the west side is a fishing pier and the entire area is popular with shore anglers who also fish from the rocky banks of the dikes. Some simply set up lawn chairs on the dikes and cast out, making you wonder if catching a fish is even part of their plans for the afternoon. 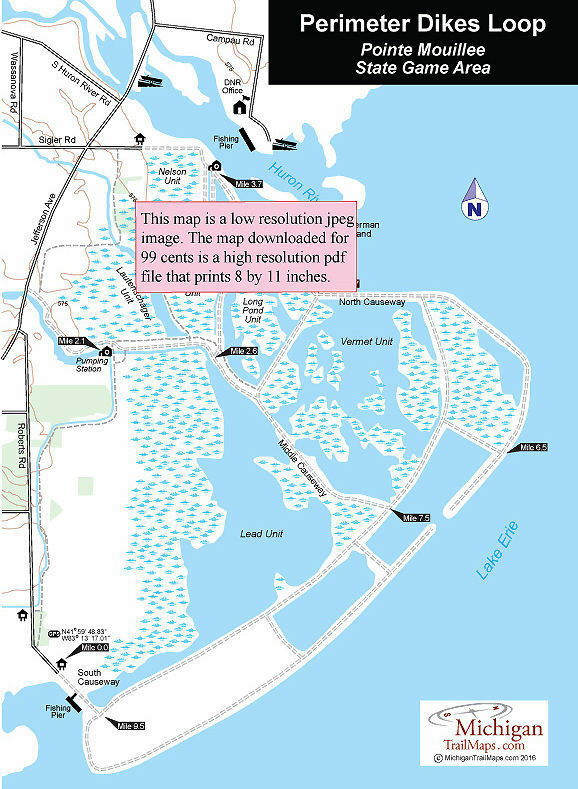 Head north (right) on South Causeway and with 0.3 mile you’ll be back at the parking area and boat launch. where your vehicle is located.